In our restoration, we maintained the exterior character of the houses, and, as much as possible, also their interior character. When possible, we have reused wood found on the property to create the furniture in the house. You can see this in the coffee table (Sopra), dining room table (Sotto) and coat racks (Sopra and Essiccatoio). Some of the craftsman with whom we worked in restoring the properties, remembered, as children, visiting previous occupants of Calboccia, and our plumber’s father was, in fact, born in a hamlet on the same hill. Each unit (Sopra, Sotto, and Essiccatoio) has a washing machine and dishwasher, central heating, and double paned insulated doors and windows. They are fully furnished, with beautifully restored country furniture, linens, hair dryers, irons, electric current converters, and radio/tape/cd players. The main house is nearly 4000 square feet in size, with equal floor area on each of two levels. 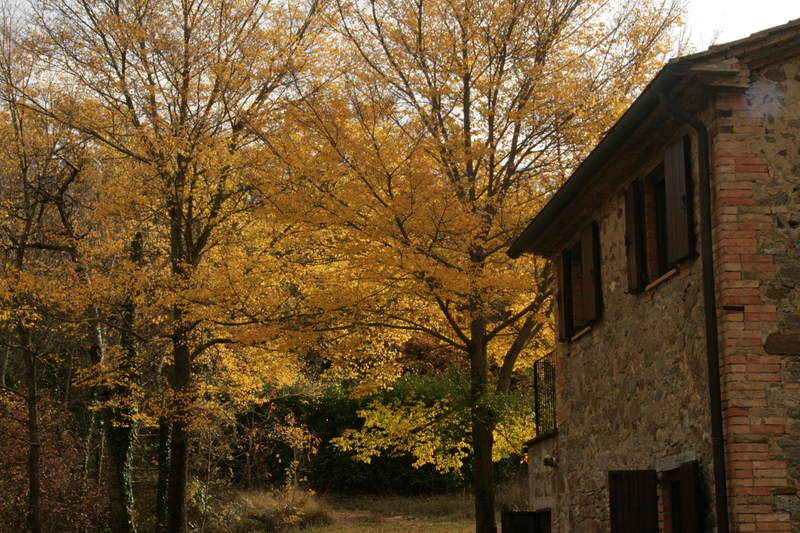 When we acquired the property from the Sorbello Family who own the castle across the valley, the stables (for cows, pigs, sheep, and goats) were downstairs and the rooms for the family or families who lived at Calbocia were upstairs. We restored the main house so that it is available to our guests either as one entire house, accommodating 8 people, or as either of two totally independent private units, accommodating 4 people each. If booked as an entire house, a walnut staircase is opened to connect the two levels.